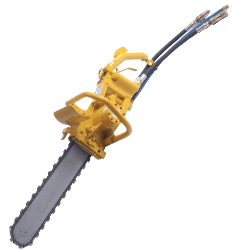 The Stanley DS11 underwater Diamond Chain Saw is specifically designed to cut solid concrete while submerged in water. Cuts square corners without over-cut and can plunge cut sea walls up to 18" thick. A minimum of 20 PSI water pressure is required for cooling and lubrication of the bar and chain.